Sylvia Fowles is off to a torrid start in the WNBA, leading the Minnesota Lynx to a 7-0 record overall and a 3-0 mark in the women's basketball First Division. 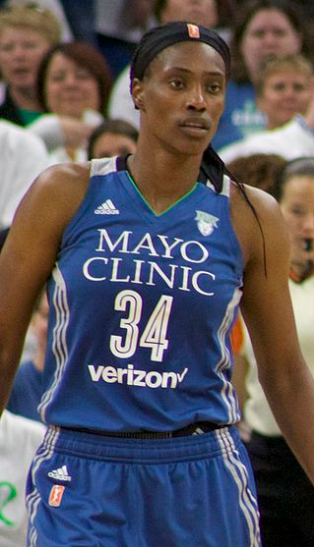 Sylvia Fowles is in the top five across several WNBA statistical categories for the Minnesota Lynx (SusanLesch/public domain image). It's pretty hard right now to argue against Sylvia Fowles as the best player in the Women's National Basketball Association (WNBA). The Minnesota Lynx is 7-0 overall, 3-0 in the women's basketball First Division, and Fowles has more than a lot to do with it. Across the WNBA, Fowles is third in scoring (20.9 points per game), second in rebounding (10.1), fourth in steals (2.1), third in field goal percentage (.643) and second in blocked shots (2.3). As the advanced metrics have it, she leads the league in offensive win shares (1.5) and defensive win shares (0.8). In First Division games, Fowles is averaging 21.3 points, eight rebounds, one assist, three steals and two blocked shots. She's also a combined plus-49 in those three games. So, the Lynx, last year's First Division champions, are making another early run at it. Their top challenger, not surprisingly, is the Sparks, who defeated the Chicago Sky 79-70 Tuesday night and improved to 3-1 in the top tier. In the Second Division, the Washington Mystics are out to a 3-0 start after defeating the Dallas Wings 101-89 Tuesday night on the road. Elena Della Donne led Washington with 23 points, adding six rebounds and three blocked shots. The Mystics are 6-2 overall.